The new All-Flash Enterprise HCI is powered by Pivot3’s patented global hyper-convergence technology, which creates a homogeneous pool of solid-state drive (SSD) resources across appliances in the array to maximize performance of any application. 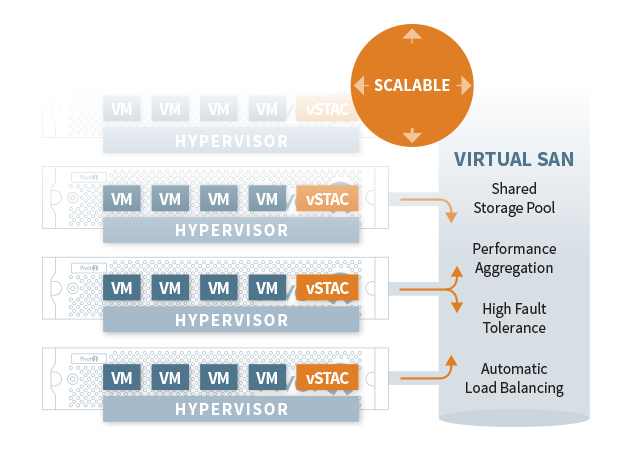 Within an array, patented vSTAC OS, based on Scalar Erasure Coding, dynamically aggregates, load balances and optimizes shared storage, compute and network resources, and provides up to 94% usable storage capacity while ensuring fault tolerance for up to three simultaneous drive failures or one appliance and one drive. Pivot3 All-Flash Enterprise HCI nodes provide enterprise-class processing performance, higher availability, and lower total cost of ownership so enterprises can realize long-term cost savings while ensuring seamless scalability as operational needs grow. Pivot3 global hyper-convergence maximizes the power of flash storage by aggregating IOPS across nodes, providing speed and low latency for performance-sensitive workloads. Pivot3 LoginVSI®test results show a Pivot3 All-flash Enterprise HCI node can support 192 knowledge users (2×12 core CPUs). vSTAC OS forms a virtual SAN that appears to any application as a conventional storage resource. It directly communicates with storage controllers in the servers across the cluster for maximum performance. Pivot3 storage capacity presents as an iSCSI target where LUNs of any size and quantity can be provisioned just like a SAN. All-flash hyper-converged nodes power more than 2X the workload hosting of competing offerings and are highly optimized to conserve compute power, supporting higher density workloads with less overhead. vSTAC OS functions very efficiently using as little as 6% of local CPU resources, dedicating remaining resources for workloads chosen by the user. Pivot3’s patented Scalar Erasure Coding protects your data without eating up your storage capacity with wasteful data “copies” used by replication-based systems and provides exceptional high availability of 99.9999%. Pivot3 delivers efficient, truly usable storage by utilizing patented Scalar Erasure Coding instead of deduplication and replication. For every TB or PB of Flash server bought, up to 94% can be available depending on configuration, as opposed to the typical 50% considered the norm in a conventional storage environment with replication-based backup. vSTAC OS can be easily customized and scaled depending on the size of the infrastructure, allowing the administrators to set capacity levels, performance settings, and availability requirements. Deliver both compute and storage requirements for VMware View customers through high performance all-flash nodes and eliminate the need for an expensive and complex standalone SAN. All-flash nodes can be "stacked" together to dynamically scale the number of virtual desktops supported while offering a familiar server appliance model. All-flash hyper-converged nodes run both the VMware vSphere Hypervisor and the Pivot3 vSTAC OS. Scale up and scale out easily via flash-based vSTAC OS Virtual Protection Groups – optimized for 12 appliances, and additional groups to enable scaling out to meet customer needs that exceed single-group capacity.